Yes, I have two about pages. I have a tendency to be a "type-A" personality and can be exhaustingly detailed and thorough, but I wanted you guys to have a quick reference as to why I've somewhat randomly stumbled into the life of blogging. I'm going to be frank here, had you asked me in 2015 what a "blog" was, I would've answered, 'let me google that'. No joke, I am the least tech-savvy person in my generation, and find it overwhelming to keep up with all of the advances and trends in the virtual realm. Surprisingly enough, the first thing I did when Derek began his application process into the Air Force, was search the internet for women who were sharing their experiences as "MILSOs" (Military Significant Other). But, go figure, I had a hard time searching since I hardly knew how! All-in-all, I decided then that as my man was about to challenge himself in so many unfamiliar ways, that I too would do the same. While blogging is hardly comparable to what my husband is about to embark on, I hope to be "that blog" for the next girl like me; seeking the heart and reality of the ups and downs of military and marital life from the start! First, is to have a healthy outlet to all of the upcoming lifestyle changes with my Mister. I want this to be a place where I can be candid, honest, and always clinging to the eternal hope I have in Christ; a diary with no lock and key, if you will! 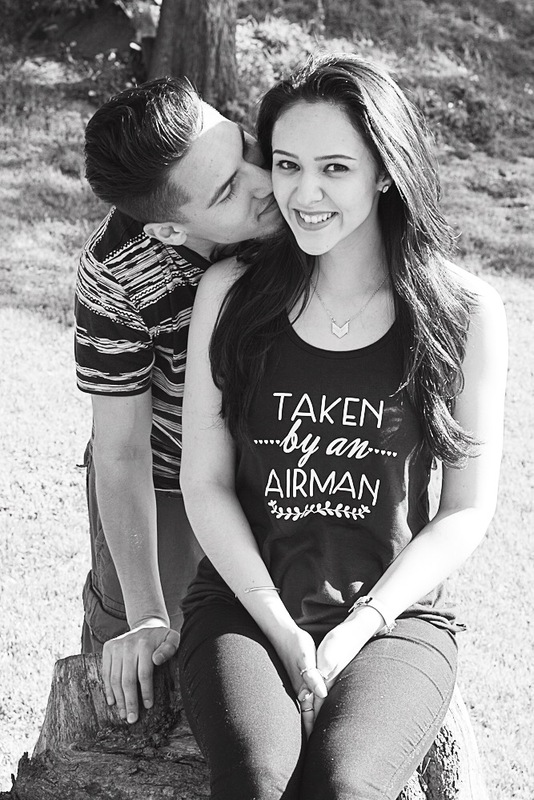 Second, and more importantly, I wish that through "Airman and Me" I can encourage and enrich the lives of young women and wives all over the world, especially -but definitely not limited to- my fellow MilSo's! This means I want to connect and virtually (or even in some cases physically) do life with you! And finally, to satisfy my girly and domesticated side, I'm really looking forward to having a place of my own on the internet where I can display pretty pictures of life with my Derek, and exchange exciting DIY projects, recipes, and home décor tips with all of you! Somewhere other than Pinterest, I guess! My prayer is that you find this blog encouraging and inspiring no matter what walk of life you are in! So please, make yourself comfy and stick around a while!